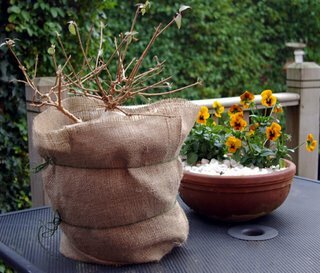 Last year on Gardeners' World, Monty Don mentioned using Hessian as a way of keeping your plants wrapped up warm over the winter. Well it has definitely been a bit cold of late and I had quite hard frosts during the week. This weekend I finished off wrapping my plants in hessian and taking the pots away from exposed places. The photo shows a variegated fuchsia, pruned back and wrapped up for winter. The great thing about hessian is that it feels so much more of a natural product than artificial fleece. You can also put in the bottom of pots and then add crock to improve drainage, or use it as a protection when you are working on lawn areas. I do have an advantage as I can pick hessian up from the shop, but it is available to order online and we now sell hessian by the bolt, so you can pick up 25m at a time if you have a large garden! 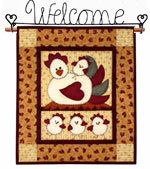 We have three new exciting Fabric Clubs launched in our new Newsletter. Free Spirit, Far East and Hoffman are all intended to keep you up to date with a number of fabric ranges. They provide you with fat quarter packs quarterly through the year with different styles depending upon the club. Free Spirit concentrates on bold and contemporary fabrics from Free Spirit in America. Far East fat quarter packs will reflect Oriental - Chinese and Japanese fabric imagery. Whilst Hoffman will provide you with a selection of fat quarters from the Hoffman company. Further fabrics can be purchased by the metre. There are a number of new books on the website, with new works on Christmas quilts, using Strip Rolls, and Japanese Bags. Written over 100 years ago and newly illustrated with an award-winning handmade quilt, this enchanting story celebrates nature's changing seasons. 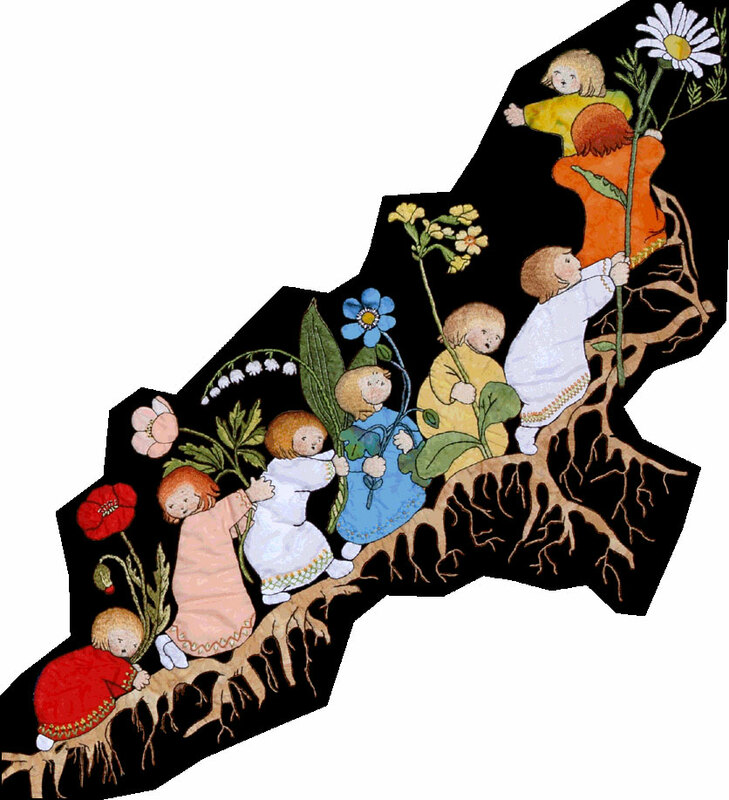 Deep below the ground, Mother Earth rouses her sleepy children. The little ones ready themselves for spring, then join a jubilant procession of bugs and beetles up into the summer meadows. With each colorful turn of the page, the children discover new surprises waiting just for them. In rhyming verse and vibrant illustrations, this enchanting story captivates the imagination of the youngest readers, gently leading them to make their own discoveries outdoors. Sibylle von Olfers is the author of the original German folk tale, "Etwas von den Wurzelkindern," which sold more than 800,000 copies when it was first published in 1906. Exactly a century later, Sieglinde Schoen Smith's quilted interpretation, Mother Earth and Her Children, won the top prize at America's most prestigious quilt show, inspiring this new translation. Jack Zipes (University of Minnesota) is the foremost expert on folklore in the United States. 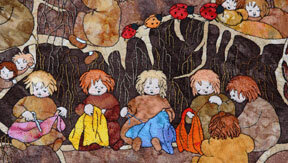 His works include the definitive English-language translation of The Complete Fairy Tales of the Brothers Grimm. Cloth with jacket, 32 pages, 9" x 10"
We are delighted to announce the 2008 Block of the Month program from Thimbleberries. The 2007 programme attracted our largest ever number of subscribers and was fully subscribed so book early to avoid disappointment! 2008 marks the ninth year we have run this popular and successful Block-of-the-Month program. This year there is even more choice with the option of making the Big Club Quilt in one of two colourways - Lodge or Lakeside - or to complete four quarterly projects instead. Or you could do both! Japanese "Taupe" fabrics are one of my favourite ranges, I love the combinations of subtle, complimentary cream, fawn and brown designs. This new range of Zen fabrics may not offer the finer finish of fabrics printed in Japan, but they are still great designs and are at a fantastic price of £7.40/metre. There are thirty six fabrics in all, available as a Charm or Special Collection pack, as six fat quarter packs or individually by the metre. 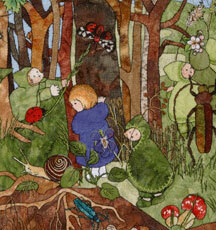 We have two new panels from Nancy Halvorsen. The panels, both approximately 60cm x 112cm, are in her classic whimsical style. We have expanded the range of colours of the great little clip on light the Xtraflex2 from Mighty Bright. We now have the Xtraflex2 in Blue, Purple, Pink and Black as well as Silver. You can clip these lights on hoops and frames, or on to your sewing machine to provide extra light. They are very versatile and you can clip them on to a book and use it as a book light in bed without disturbing your partner as you thumb through the latest quilt book. At the weekend I was doing some plumbing, and it was great for clipping on to a pipe and giving light on those hard to reach places. We keep one in the car and use it for map reading without disturbing the driver. Moda has produced a new range of fabrics for its successful Quilt Pink initiative, which ran last year. Quilt Pink is a US sponsored event to benefit breast cancer research, so for our part The Cotton Patch made a donation from our Quilt Pink sales to St. Mary's Hospice, which is a local Birmingham-based charity. We have a Charm Pack of 25 fabrics as well as a fat quarter pack and 13 pink fabrics by the metre. The fabrics are priced £9/m and we will donate 50p for every metre sold. Our extensive Batik fabric range has been further enhanced with eight new Batiks (refs 1697 1-8). From burnt orange to deep blues, these Benartex fabrics are deep and vibrant colours. Shown is Batik 1697-1, available by the quarter metre.